A North Sea helicopter giant has flown to the aid of a local neurological disease charity. Bristow Helicopters has announced they will help fund the Grampian MS Therapy Centre throughout the whole of 2019. The MS centre, which is located in Dyce, will receive additional support from the British civil helicopter operator for the current year to help those affected by the condition. More than 100 residents living with MS in the north-east depend on the therapy centre, which first opened back in 1983. The Aberdeen facility relies entirely on donations and offers a range of services for those with MS including specialised physiotherapy, reflexology and oxygen therapy. 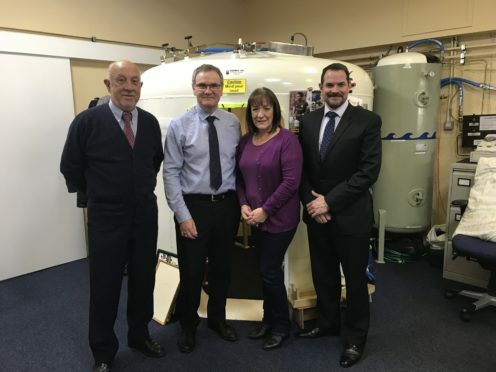 Bristow first started working alongside Grampian MS Therapy last summer and donated four new chairs, which has allowed the charity to open a new oxygen room. Centre manager, Eileen Matthew, has been delighted by the firm’s help. She said: “Our current oxygen chamber can be used by up to five people, but some users find the experience claustrophobic. Bristow’s donation enabled us to open a new oxygen room which is a larger, open space. This fundraising is part of Bristow Uplift, an internal programme which sees the business partner with local communities, charities and non-profit organisations. Matt Rhodes, the company’s director of UK oil and gas, said: “Members of our team visited the centre last year and were struck by the generosity of the volunteers who run the facility to ensure those in need receive this life-changing therapy. Bristow has raised over £1,000 this year for the Aberdeen-based charity and hopes to continue to work closely throughout the rest of the year.